I can’t walk by a magazine stand without seeing at least a dozen covers on how to “boost metabolism”. And if you google the word “metabolism” you’ll find over 85 million hits, mostly on how to “speed-up,” “ignite,” or “boost” your metabolism to blast fat and build muscle. Is this just marketing hype? Or can you really do something to help your body burn calories faster? Metabolism involves a complex network of hormones and enzymes that not only convert food into fuel but also affect how efficiently you burn that fuel. The metabolic process establishes the rate at which we burn our calories and, to some extent, how quickly we gain weight or how easily we lose it. Metabolism is influenced by your age (metabolism naturally slows about 5% per decade after age 40); your gender (men generally burn more calories at rest than women); and proportion of lean body mass (the more muscle you have, the higher your metabolic rate tends to be). And check one off in the “life-isn’t-always-fair” category: heredity makes a difference, so some of us inherently have faster metabolic rates than others. But if you are struggling with weight, don’t blame all your woes on a slow metabolism. While some people do suffer from metabolic disorders that make weight gain very easy (and weight loss very difficult), these metabolic conditions are not responsible for most of the overweight and obesity we see today. For most women of average height and build, basal metabolic rate is .9 calories per kilogram body weight per hour or about 1,300 calories a day for a 130-pound woman. A man’s basal metabolic rate is about 1 calorie/kg body weight per hour because they have a higher percentage of lean mass naturally compared to women and have a higher basal metabolic rate. 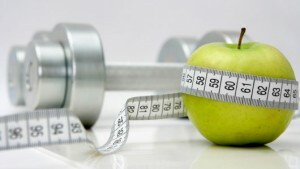 Boosting Metabolism: Fantasy or Fact? Even if you weren’t born with “skinny genes”, there are things you can do to increase your body’s ability to burn calories faster. Appetite for Health Co-Founder Julie Upton MS, RD, has written frequently about the #1 thing you can do to rev-up your metabolic rate: Exercise. Working out builds muscle. Muscle speeds metabolism. As the body works more efficiently, it processes food faster. For specific exercise regimens that have been proven to help boost metabolism, check out Julie’s articles, Burn, Baby Burn: Intensity is Best for Boosting Metabolism and CrossFit: Get Fit Fast. Eat More Often! I hope you read that carefully — it’s not “eat more”, just “eat more often”. Small, but frequent, meals help keep your metabolism in high gear, and that means you’ll burn more calories overall. When you put too many hours between meals, your metabolism actually slows down to compensate. If you then eat a huge meal — at the same time your metabolism is functioning as if you’re starving — your body wants to hold on to every calorie. While this won’t make much difference on an occasional basis it can become more difficult to lose weight or maintain weight a healthy weight if you frequently skip meals. Drink Water Often: Dehydration has been found to decrease your metabolic rate by 2 percent so staying well hydrated is an easy way to help boost overall metabolic rate. Strive to get at least half of your body weight in fluid ounces of water every day. Eat More Protein: The amount of energy the body requires to digest and metabolize proteins and carbohydrates makes up about 10% of your total metabolic rate. However, there are big differences in how much energy is required to digest each of the macronutrients. Fat, for example, has a thermic effect of 0-3% for fat, carbohydrate is 5-10% and protein is 20-30%. The thermic effect means that if you eat 100 calories of protein, 70-80 will be usable but the same 100 calories of olive oil will provide the body with 97-100 calories to use as energy or add to your love handles. Research shows that doubling your protein from about 15% of calories to 30% of total calories helps cut 150 to 200 calories a day. Grab Some Joe: (No, not a guy named Joe — although you are welcome to do that too!) I’m talking about coffee, tea, or other caffeinated (but low or no calorie) beverages. Caffeine will boost your metabolic rate for up to three hours after consumption. Research has found that when women consumed 1,300 mg of caffeine (roughly equivalent to six, 8-ounce cups of brewed coffee) over 24 hours, they burned an additional 136 calorie a day. For more on boosting metabolism and weight loss, don’t forget to pick up our book, The Real Skinny: Appetite for Health’s 101 Fat Habits & Slim Solutions.